This is most of my tea collection at home. I have a small one at work too. I took stock of my tea collection at home over the weekend and realized that I should finish the tea I have before buying any more, especially the loose-leaf tea since tea does go bad. Keep away from heat, light, and humidity. Keep in a dark, cool cabinet or pantry. Buy in small quantities to ensure that the tea is used before it spoils. Clearly, I've failed the last point. 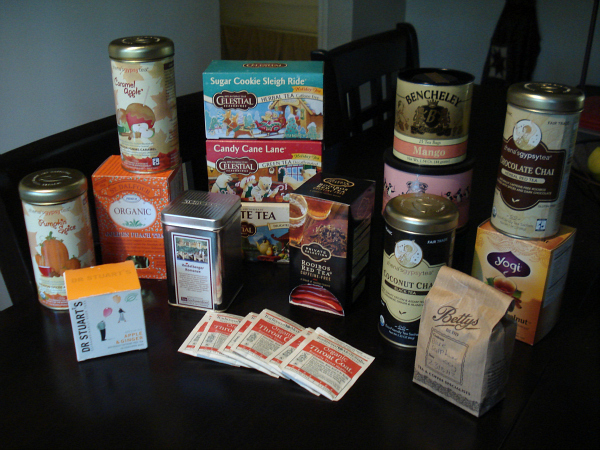 I have promised myself that I will not buy more tea for the next three months. I better get my (tea) drinking cap on, because this tea collection needs to be drunk! Anyone want to come over and help me? Norbert (my owl) and I wish you a splendid week. As my dad always says: "Make it a great day!" I love that mug!! Where did you find it? I am not a big tea drinker but I love cinnamon apple tea at Christmas :) One of my favs! YES! In fact, I've got my own bag of Blue Sapphire tea, so we should drink some together... on Skype! you and Jon's mother would get along famously. I think that 98% of the things she says starts and/or ends up "so who would like tea?" 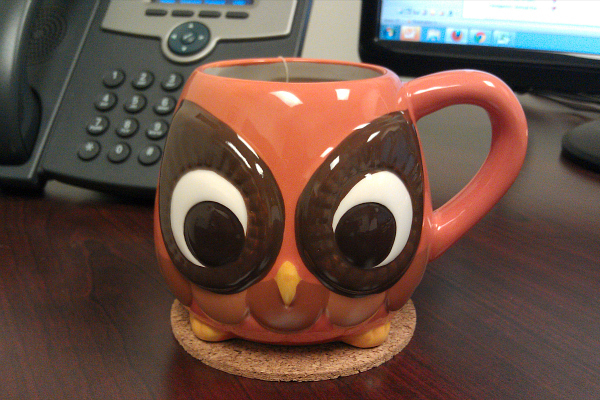 Love the owl mug! I know from your post you are on self imposed tea buying ban but have you ever tried Teavana's loose leaf teas? I absolutely love them and they come in all different kinds (green, white, black, mate, etc...) and all different kinds of flavors (Blueberry Pinapple Kona Pop is my favorite in the summer and Youthberry Orange or Samurai Chai Mate in the winter). Of course I'd have mine stored in a plastic oxo container, haha! See this is why I love your blog :) Thanks for the tip Lindsey! i love this! so informative :) and i adore your instagram mugs, hehe. I loooove tea. And I didn't know those handy tricks. So thank you! I also have an impressive tea collection. I need to get going on it too! You switched your sidebar from the left to the right. I like it. This is so helpful! I've been trying to get more into tea, but was having a hard time knowing where to start! I'll have to try some of these :) I bought some Earl Grey and I had some herbal tea left over from college (totally didn't know it went bad btw- thanks for the heads up! Just went and cleaned out my stash of the expired stuff.) Also, I'm a fan of Norbert. That is all. I'm so glad someone else shares my tea addiction. I really, really, really want that mug. Uber jelly. I also want to name my future mug Norbert. You're a genius. I'm not sure I know to make tea the right way! I never like it when I have it. I need to find the right one I guess. :) Tea date? now i want some tea, though maybe iced since it is damn hot here! Omg can't believe I am so behind on reading your blog! To top it off I love this post! So glad I am not the only tea horder! 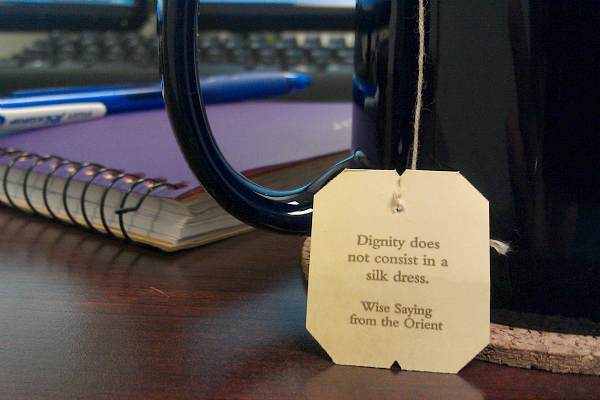 I love tea and we even have one in common! I love that sugar cookie one! You must try the gingerbread spice one sometime. It's another holiday blend from celestial seasonings! I hear ya too on buying too much! I have to stop! It helps that hubs and I both drink a bunch of it!